I wish I had some new quilt to show you all, but this work thing really gets in the way of quilting! I did make it to the Seattle Modern Quilting Guild’s last Friday night sew-in though and came home with some inspiration. 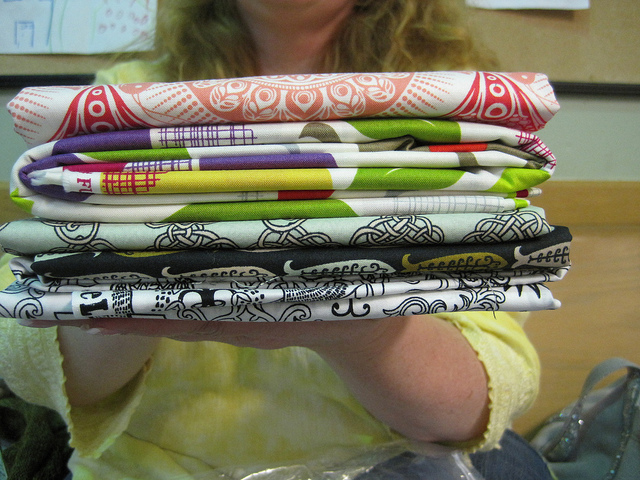 My favorite was seeing my friend Noelle’s hst quilt finished! I meet Noelle when she took this class from me, so it was super fun to see it finished. 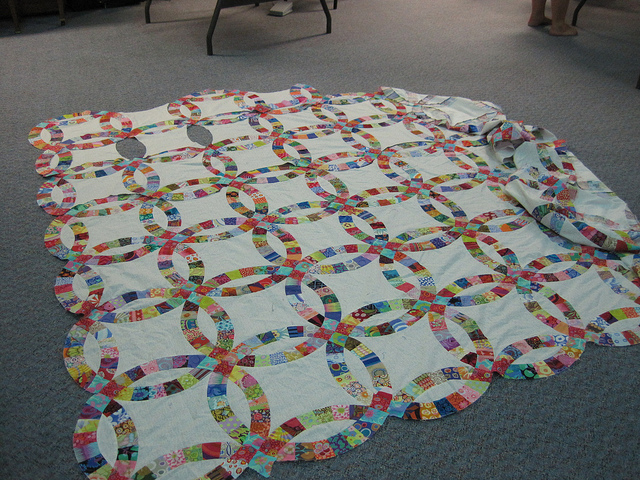 This baby is King sized and quilted by Angela of Quilting Is My Therapy. I should have gotten some close ups cause it’s amazing of course. 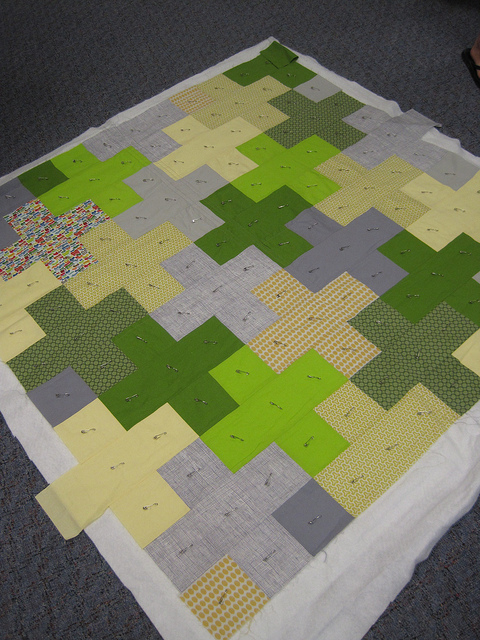 I still have a cross quilt on my list. Two by Season and Sue were under construction at the meeting. I love the madras and sea theme in Sue’s. She is the most prolific quilter. Season has a talent for combining fabrics in a way that I always love. The addition of the multi-color print is something I never would have thought of and it makes it for me. Kathy’s double wedding ring is awe inspiring. I would still be making this on my death bed. 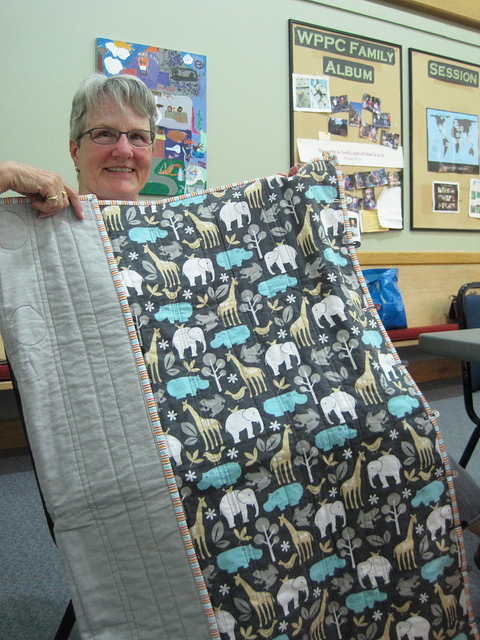 Sweet Joan was making a flannel whole cloth quilt. She took my whole cloth quilt class, so I was happy to see the knowledge she took with her was inspiring her to make more. We had an opportunity to meet up and cruise the shelves of Drygoods Design prior to the meeting. I could have dropped a bundle on her amazing collection of modern fabrics. Pop by her site and check out her combinations, she has an eye candy site. That’s it for now. 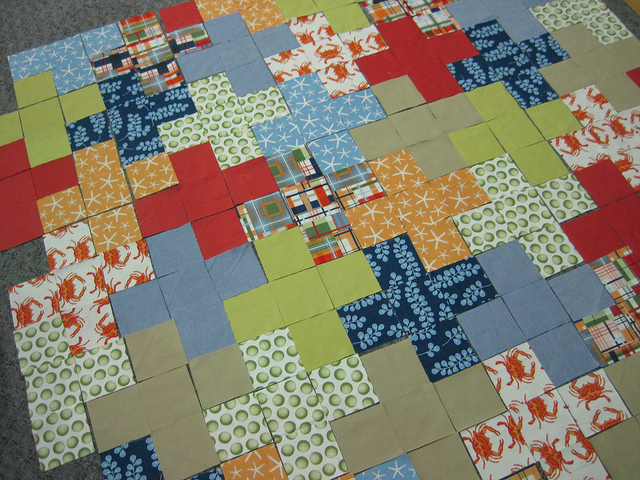 I’m hoping to add some blocks to my Scrappy Sunshine in the next two days that I have off in between errands. I now know why people make baby size quilts. Katie — would you be willing to send me the schedule or list of upcoming sew-ins? I can’t find a schedule on the “wall” site, and I very much want to join the fun! Wow – that hst quilt is a.ma.zing. 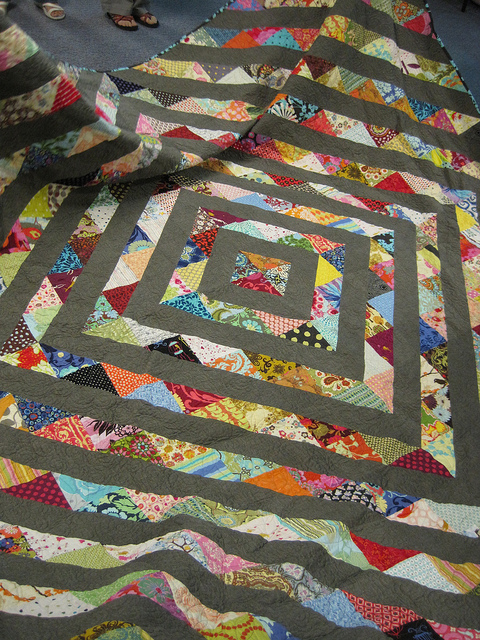 I wish I had more time for quilting (I totally understand what you mean about the job thing)! Great eye candy.Totally right about that multi-colored print in the cross quilt. It’s pretty stinkin’ genius. It was such a fun night! Thanks for the love, Katie. You and the guild are constant inspirations to me! wonderful quilts, my favorite is the hst one. It’s a nice use up of scraps, I like especially the grey as a connecting background. Thanks for posting! I’m loving sleeping under my very first quilt! Thanks for the love of my HST – it was a long haul but I did it. By any chance do you know what size the half square triangles were in Noelle’s absolutely fantastic quilt? Where can I find the pattern for the first quilt? It’s gorgeous! I agree–would love to find the pattern for that first quilt!